Have you made empathetic marketing part of your strategy? If not, you should. Let me explain. 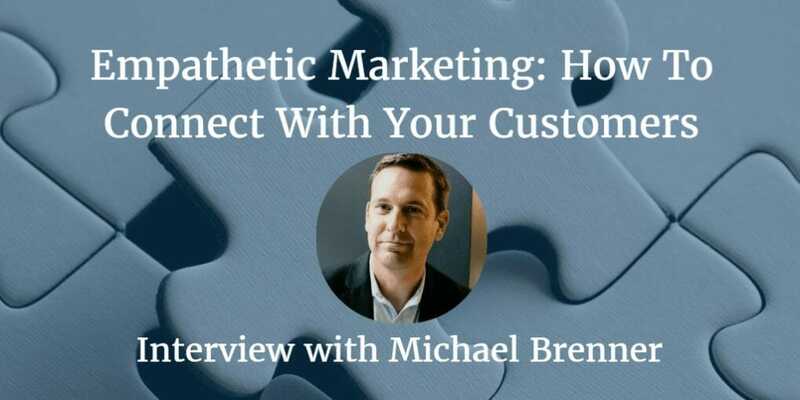 I interviewed Michael Brenner (@BrennerMichael) the CEO of MarketingInsiderGroup.com. Michael has received recognition across the Internet for his knowledge and role in shaping content marketing as we know it today. He’s a sought-after keynote speaker and co-author of The Content Formula. I’m excited to bring his thoughts on empathy to you. Can you tell us a little bit more about yourself and your background? Michael: Yeah, sure. Thanks, Brian. It’s a pleasure to be with you today and looking forward to talking about empathy, which I think is so important in today’s landscape. As we get older, I’ve needed to summarize my career much more quickly than I used to. But a 20 plus year career in sales and marketing, and leadership roles in various kinds of companies, large and small. Most recently, about ten years ago, was hired by SAP as their first head of digital marketing. I became their first VP of Global Content Marketing, and mainly helped them modernize the digital marketing approaches that they were taking. Very much taking an empathetic approach like we’re going to discuss. There’s such a need, I think, for brands to understand. They want to do it I think but struggle with how to get it done and how to change the culture inside their organizations. That’s where I’m focused now. I built Marketing Insider Group, primarily, as kind of a one-man agency for now, but with the point that I’ve been there, I’ve done that, I’ve been inside corporate marketing departments. I understand the politics and the culture challenge that marketers face today, and now I’m dedicating my life to trying to help as many companies, as many brands, as many marketers as I can, to understand how to put themselves in a leadership position by helping their customers. What inspired you to start writing and talking about empathy recently? Often, I find someone in a position of power (with their arms folded) asking challenging questions like, “Well, how’s this going to help us sell more stuff?” I co-authored a book called The Content Formula, to specifically address this sort of results-based question, which was, how do you show ROI from this approach? In the book, I talk about how you can show a better return on investment with marketing that focuses on delivering content people want. Even after all those sorts of financial objections are removed, I still found that there was resistance inside a lot of companies. I think we can talk about this in a little bit more depth as well, but there’s a natural instinct inside a business to want to promote itself. That’s counter-intuitive. That’s why I came to this kind of realization that the missing element, and you’ve been talking about this for a long time, is empathy. It’s missing inside corporate cultures and structures. 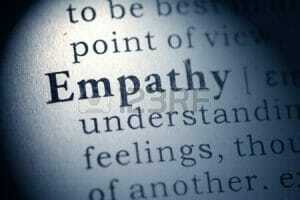 Empathy is the most counter-intuitive secret to success. Why is that? For instance, the posts that I put up on Facebook. I don’t do a lot of business content on there. It’s mostly pictures of my kids and the trips we take, and it’s essentially me putting my best face forward to the world. That’s what I think we all tend to do in the social world; that we express to the connections we have. It’s our natural instinct. I think there’s nothing wrong with wanting people to see that you’re happy and you’re healthy, and you’re doing fun things. That’s the natural instinct we carry with us when we walk into the company, with the companies that we work. The natural instinct of the business person is to want to promote itself and put its best face forward. It’s counter-intuitive to think that you can sell more stuff by not talking about the stuff you sell. That’s why I think empathy is so counter-intuitive. 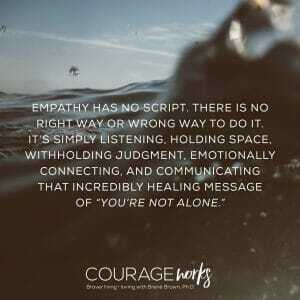 The most counter-intuitive secret to success in business and life is empathy. Brian: I know it’s something that I struggle with, and I think everyone does when we’re focusing on getting our needs met, whether that’s hitting a number, as you talked about achieving ROI. It’s a challenge, and I think you spoke of this collective amnesia we have. It seems that we change how we think about our customers as we walk into the building and put on our marketing and sales hat. How can we overcome our collective amnesia and relate to customers? I love the term coined by Noah Fenn, who is head of video sales and strategy at AOL. He talked about how this instinct to self-promote: it’s like a collective amnesia. And what he means by that is kind of like I said: that although we’re real people when we walk into our places of work and then forget that we are real people. We forget how to market to people just like us. That’s essentially the collective amnesia. We walk in; we want to present and promote the companies and the products that we sell. That’s precisely the kind of thing that we as consumers don’t want, right? Someone heading marketing, who makes an ad buy, is doing that with the knowledge that he might, or she might, hate ads. That’s the collective amnesia, right? When you’re watching a TV show, you don’t need to see an ad for Chevy 15 times over the course of the 45-minute show, right? But the ad buyer for Chevy is making that decision. There’s a group of individuals generally behind those kinds of decisions, and that’s the collective amnesia that we talk about in the article. We make judgments in the business, as people, that often forget that we’re marketing to real people just like us. Brian: It’s funny, and I think it’s interesting. As I talk to marketers, we realize just how cynical we can be too. And I believe that it’s just getting out of our heads. We need to put ourselves in the shoes of our customers and remember we are ones (customers) too. What do you wish marketers and sellers would do more? Like you said, we’re skeptical, and we live in a noisy world. The loudest shouter gets the most attention. That’s precisely the thing that I think the data that we now have in the digital marketing landscape is proving isn’t working. As people, we know it’s not what we want. We have to resist that sort of notion and put our customers first. It starts by helping, not selling. What that doesn’t mean is that it doesn’t mean we have to let go of the need to drive results. That’s why I love the line that when you help your customers, it’s the best way to help your business. What are some suggestions you have on how we could get better at this? The secret to being effective and efficient with the marketing that we do starts with this understanding that we are real people, we’re trying to market to real people, and the best way to do that is actually to be helpful. It’s to want to help them. Not just with the products and services you sell, but to help them as people and help society as a whole solve its problems. I think it’s a nobler cause and it’s a much more challenging thing to do inside corporate cultures. Brian: I’m so glad you’re bringing this up. When I talk to marketers and sellers, I find that they don’t want just to feel like they’re making an impact on the top line and bottom line. They want to feel like what they’re doing is making a real difference beyond the numbers. Michael: There are enough people out there talking about this desire to work for companies that have a real purpose or even a kind of social mission. Even at the individual level like you said, we all want to do work that matters. One of the insights that I’ve found is that being productive in my job was never enough to make me happy. I was only ever happy when I was effective and making an impact with something that I believed in. It’s the combination of both meaning and impact. We all make an impact. It’s just about whether we make a bearing in the right direction for the right cause, for the right purpose. It can be a corporate purpose. It can be a financial purpose, but there has to be a customer at the end of that financial decision where you’re solving a problem. Again, I think it just comes back to being empathetic allows us, as employees, as people, to feel like we’re making an impact in a way that matters to somebody. Can you share any stories or examples of applying empathy to marketing/sales? Well, I have a positive and a negative story. It’s not negative. It’s a lesson that’s public, and I got a glimpse of it in private. I’m a customer and a huge fan, and I have to say as a caveat to this. Big fan of Wells Fargo. Still a happy, satisfied customer with them. I had an opportunity to present to their marketing team about six months ago before the scandal broke. Maybe it was nine months ago, before them trying to sort of force accounts on people. The conversation we were having was very much like this one. It was about how content marketing requires a focus on actually solving customer problems, and there’s one way to know if you’re doing that. That’s with engagement. You can measure engagement in the form of time on site and in the form of social shares, and in the form of whether people subscribe to your content. Those are all deep measures of not just are you reaching people, but are they voting? Are they giving you a vote of confidence in the content you’re creating? The example I used was, “You can shout into the wind, or you can speak one on one to the people that you can help.” That’s the choice you have as a brand. I don’t think that analogy went over very well. It was only a few weeks later that the story broke and I believe that we’ve all seen what’s happened there. You can shout into the wind, or you can speak one on one to the people that you can help. I’m optimistic that they’ve learned a lesson. I think that Wells Fargo has such an incredible corporate history and culture, and I believe that there were just a few of the wrong people in leadership positions who were forcing a value in pushing the business over the needs of the customer. It’s exactly, I think, the wrong way to approach this whole idea of help your customers and you help your business. It’s the opposite. Brian: When we focus on the wrong thing, we can almost become sociopathic trying to get our needs met at the expense of others. In this case, clearly, Wells Fargo customers didn’t get the benefit as Wells Fargo was getting its needs met of revenue. Michael: I think the main lesson for Wells Fargo, and it’s kind of like it’s in their mission statement, is that they want to help customers. The problem was culture. People talk that we need to change the culture. Well, culture is just a codification of what’s valued by the organization. Leadership is just a personal expression of values. I think what Wells Fargo learned was that they had the values in place. They had named them. They had documented them. They just weren’t putting value behind them. They weren’t promoting people. They weren’t making a good example of the people that were promoting the right values for their business. Let’s switch to a positive story that you could share. I’m going to go back to my former company, SAP. I read an article in Harvard Business Review a couple of months ago, Top 10 Empathetic Companies. SAP is number 10 on the list, and I’m proud to see them make that kind of recognition. Their CEO is a guy named Bill McDermott, who was instrumental in my career and mostly he mentored me and created an opportunity for me to do what I was able to do at SAP. He had a life changing experience. He had an accident about a year, maybe a year and a half ago. He came back transformed from that experience and decided that it wasn’t just about making the numbers. He was a hard-charging sales guy. A super successful individual. One of the most charismatic leaders I’ve ever met. He was superb at motivating SAP to hit the number, hit the number. He came back, I think, really transformed as the first American CEO of this German company. There’s an article I think out on Forbes or Fast Company about this journey. He’s making empathy a valued, rewarded, recognized value inside the organization. They’ve turned the ship. They’ve changed their culture, not because they tried to change their culture. They’ve changed their culture because they focused on putting a value on this very touchy feely kind of dippy hippy sort of emotion called empathy. I think it’s a great example. You can see it in their advertising. They don’t speak about their latest products. They show how they’re helping their customers run better. Their whole tag line is a customer focus, so even when they do advertising, it’s at least customer-focused messaging. You can see it was the reason I was able to implement the content marketing program I did, and the reason why I think they’re a leader in the technology marketing space for sure. Brian: I think what you brought up as the example is that it’s hard for us to be empathetic outside unless we first have that transformation inside, in how we relate to others, how we relate to our teams. It does take leadership to do this. Even self-leadership. What advice do you have for those who want to sell the idea of empathy? Yeah, it’s a big issue, and it’s precisely the topic that I’m looking to address in a lot of my outreach and content, and keynote speeches this year. It’s essentially this notion of what I call champion leadership. It’s easy if you’re Bill McDermott: you’re the CEO. You can decree that empathy is now necessary, but what do you do if you’re like most of us? You’re down the pole a little bit, and you’re looking up, and maybe you don’t feel that it’s valued across your organization. I think the best way to do this is you need to be empathetic by putting that recognition on others inside your organization who push these ideas. If you see someone who is fighting to create a customer-focused piece of content versus a self-promotional ad, support that person. We all have great ideas, but ideas are worthless unless someone supports them. If you’re not getting support from the top, the concept I’d like to encourage people to think about really is we’re all leaders, but do we champion other people’s great ideas? It starts with, I think, just being almost self-sacrificing, to begin with, which can be just as hard in a hard-charging corporate culture as empathy can be. I think just starting with that concept of who can you help in your organization to promote the excellent customer-focused ideas, the empathetic ideas that they have. Brian: That’s great advice. It is also challenging too because I find in my experience, that it’s easy for a split second to switch from thinking of others to thinking of myself. That’s just a regular thing. As you’re talking about it, it is setting that intention to value others, to value their ideas. Well, this has been a great interview. I’ve come away with some great insights from you, Michael. Thank you so much. What’s the best way for readers/listeners to get in touch with you? I appreciate that. Its MarketingInsiderGroup.com is my website, which I’ve modeled after this whole empathetic approach instead of pushing products and services. It’s essentially more of a blog where I’m sharing content that I think is helpful, with a little bit of an explanation of what we do. MarketingInsiderGroup.com. You can also follow me on Twitter @BrennerMichael or connect with me on LinkedIn and Facebook. I’m happy to connect with the audience there as well.